Last time I told you about a friend waiting for his System of Sight glasses. I’m sad to report the glasses didn’t work for him. He returned them. It is important to know that during his consultation, the Systems of Sight representative told him the glasses probably wouldn’t help him. Grasping at straws, my friend tried them anyway. This man did tell me about a friend who has the glasses and they work for him. That’s why he went ahead and ordered the glasses, hoping they just might help him, too. With this example, we learn the glasses help some people and don’t help others. 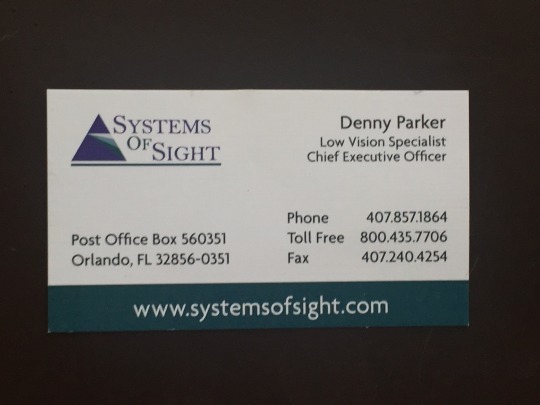 A phone call to Denny Parker in the Orlando office might help you decide whether the trip to the office in Orlando or the one in Memphis is worth your time. I talked to Denny to learn more about the glasses and he assured me he is willing to talk to possible clients who call him. If he is with a patient, be prepared to leave a message and he will call back. If calling from another country, have a translator available if necessary. One indicator of whether the glasses will help is your vision must be stable for the past month. In other words, no current bleeding producing changes. The glasses can help both wet and dry macular degeneration. The chances of the glasses working go up if both eyes are the same. In other words, if one eye is good at 20/20 and the other has macular degeneration, the chances of the glasses working go down. If you have dense cataracts, they must be removed first. With cataracts, the vision is cloudy and the glasses will not work as designed. Also, with glaucoma, the glasses won’t work if the peripheral vision is not good. If the pressure is under control, then the glasses might help. About 45% of Denny’s patients will see a big improvement. During the examination, he helps patients to see what they will see with the glasses. He even takes his patients outside to see if the glasses will work. It’s not a matter of just reading an eye chart. The glasses don’t do the same thing for everybody. We are individuals and all eyes are different. Maximizing the visual potential is the goal. When this goal is achieved, independence goes up. With more independence, the quality of life improves.